Please contact the instructor for details on costs per session/membership. 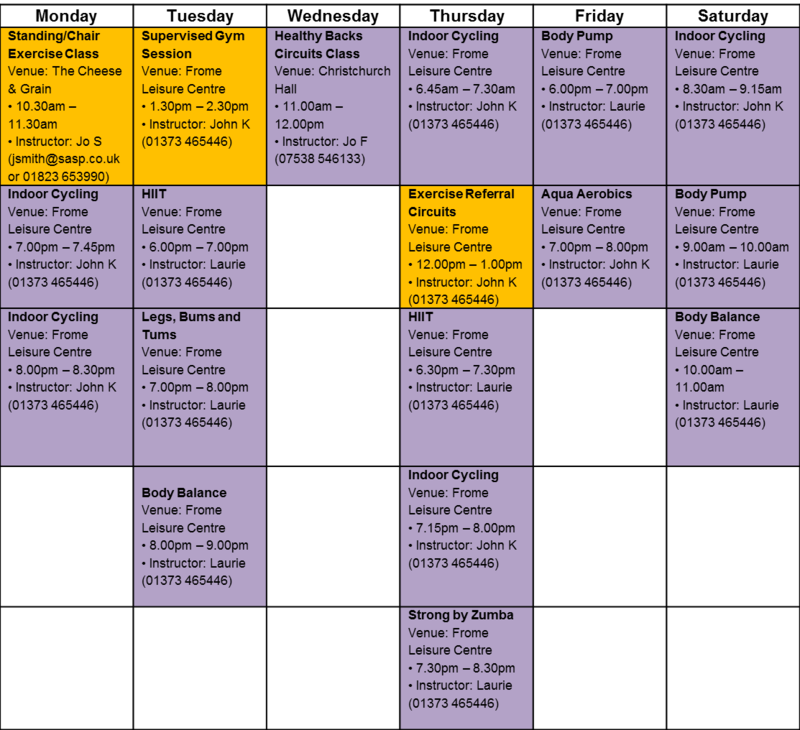 Please contact the individual instructors for advice on the best session for you. Jo has the following qualifications: Level 3 Advanced Fitness Instructor/Personal Trainer, Level 3 GP Referral, Level 3 Ante Natal/Post Natal, Level 4 Obesity/Diabetes, Level 4 Low Back Pain, Level 2 Exercise to Music and Level 2 Circuits. John is a level 4 Qualified Instructor, has been an Exercise Referral Qualified Instructor for over 3 years, Level 4 Exercise After Stroke Instructor and a Personal Trainer with many of his clients starting off as Exercise Referral Patients. He is based in Frome but also works in Wiltshire, with all age groups from 16-85. Laurie's fitness journey started in a woman's only gym needing no qualifications so during this time she studied for her Level 2 Gym Instructor qualification. After completing this she gained her Level 3 PT , Exercise to Music and GP Referral qualifications. She has many group exercise qualifications and now teaches 14 classes a week ranging from Body pump, HIIT, aqua fit and body balance which is a yoga and Pilates fusion. She also works in the gym as a PT/gym instructor.